While fall injuries are a serious concern in the construction injury, they are preventable with some essential training, including ladder safety training. Picking up from Fall Injury Facts and Statistics for Construction Workers (Part 1), the following presents some additional information regarding the prevalence of fall injuries on construction sites and what industry leaders can do to reduce these injuries, make construction site safer and, ultimately, to save lives. 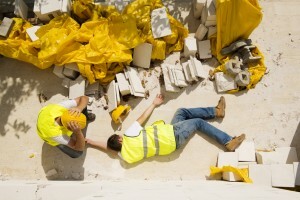 Specifically, while Part 1 of this blog focused on providing some fascinating and chilling statistics regarding how often fatal fall injuries occur at construction sites (and the types of falls that are more likely to result in a deadly head or brain injury), here in Part 2, we will take a closer look at what should be done to minimize the chances that construction workers will sustain serious, potentially life-threatening fall injuries. Train construction workers on ladder safety and other safety techniques when it comes to navigating scaffolding, working on roofs, etc. Always use the 3-point of contact rule when climbing a ladder (This rule states that, at any given time when a person is on a ladder, he should have three points of contact with the ladder – whether that been two hands and one foot or two feet and one hand). Always face the ladder when moving up or down on it. Place your feet on the center of each rung, and don’t lean over to one side or another while on the ladder. Don’t try to carry heavy loads while climbing ladders. Do not use the ladder if there is already someone else on it. Never stand on the top rung of the ladder.